PenderFund Capital Management manages approximately $40 million of assets in BC-based companies involved in the technology and life sciences sectors. The website needed to give potential investors information on the two funds (Pender Growth and Pender NDI Life Sciences) managed by PenderFund, as well as general information on VCC funds in BC. Working with the web programming firm Coverall Crew and writers Inscript Language & Writing, Emdoubleyu designed an easily accessible and intuitive architecture and navigation system for the data-heavy website. The main goal was for users to always be aware of where they are in the site, and be no more than two clicks away from any other area of the site. The Fund areas are colour coded to further differentiate them from the parent company. The colour palette ties into the print and PDF communication materials that were developed in concert with the website, ensuring continuity in the brand presence of PenderFund to its various audiences. Pender Growth Fund is a VCC investment fund that focuses on companies who are in the late-stage phase of their growth, meaning they are companies that are restructuring or expanding and have a proven track record, as opposed to start-ups which can be a gamble. Pender required their first annual report to clearly articulate where the Fund invests its monies as compared to other VCCs, and establish itself as a safe, credible and professional group of managers. The 7″ x 9″ report is printed in 3 colours to demonstrate frugality to shareholders, and the copy is clearly written in easy-to-understand language. It has been a very successfull promotional tool for Pender, with the style of messaging being used in all other areas of communications for the Fund. The second annual report for Pender had a much different audience than the previous year. The addition of a second fund to the report complicated the financials and forced us to focus on the messages that were truly relevant to the shareholders. 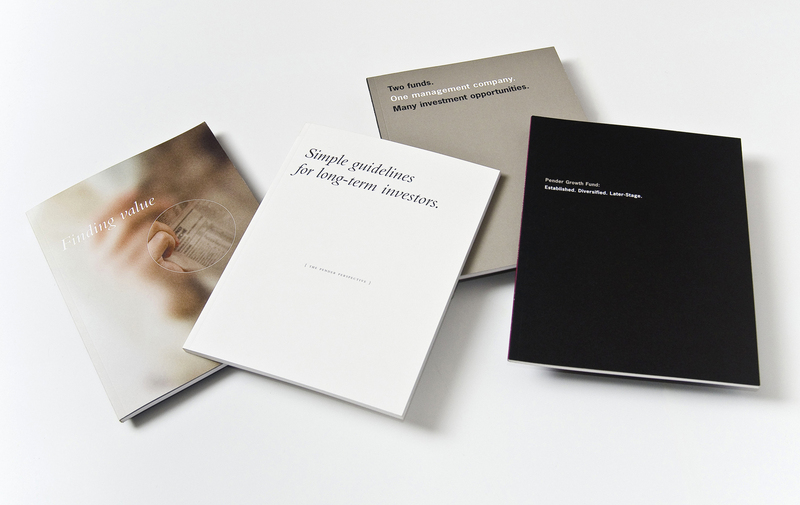 As the recipients of the annual report were already aware of the tax benefits of the two funds and where in the life cycle of companies Pender Growth and Pender NDI Life Sciences focusses, we decided to reassure the shareholders’ confidence in their investments by profiling the four main managers of the funds. By using the PenderFund managers’ own words we highlighted their expertise, knowledge and commitment to the funds, and backed their statements up with relevant reporting and technical data, and colour-coded financials to differentiate the two funds. The book retained the 7″ by 9″ size so as to maintain continuity from the previous year. This is the third annual report for PenderFund. Its main goal was simple: convince existing investors of the value of reinvesting in the company’s two venture capital funds. The report conveyed the four key PenderFund messages: 1. Diversify your portfolio; 2. Maximize your tax savings; 3. Focus on underlying value; and 4. Look beyond popular investments. Through minimal ornamentation and dramatic typography, we brought focus to the simplicity of the four points. Charts and diagrams were technical or diagrammatic in style to complement the textbook-style cover. Colour coding for the two distinct MD&As and financials differentiated between the two funds managed by PenderFund and made it easy for investors to access information. For the 4th year of the fund’s existence we chose to focus on some of the successes that Pender had had with its investments. Their experienced management team always brings their unique insight to potential investee companies, and the successes covered a wide range of industries and managerial or restructuring issues. The blurred images with an area of clear focus illustrated this ability in a simple and direct manner.